Not much to your surprise, there are many diseases that are most common in both animals and humans. Whether it is a case of diabetes, arthritis or urinary track diseases, dogs and cats as well as humans suffer from the same diseases. When a four-legged companion is part of your life, you look into all his/her aspects of life and are always on the verge for their good health. Like humans, these speechless friends do suffer from various diseases and require proper attention and care. As I mentioned the diseases above, hypertension is not an exception. Dogs and cats in most numbers suffer from this ailment. But, very few pet parents are able to recognize this disease and by the time it is measured in the instrument, it’s too late. If you are keen to find all about this blood pressure disease, dig deep and find how you can help your pet from this life-threatening disease. Commonly referred as blood pressure or hypertension in humans, it is the same in dogs and cats. It’s not so common but hypertension does pose a threat to pet’s life. Hypertension results when the dog’s arterial blood pressure is continually higher than the normal. When it the side effect of another disease, it is referred as secondary hypertension. The primary hypertension is normally a disease, which affects many of the dog’s body systems such as eyes, kidneys, heart and the nervous system. 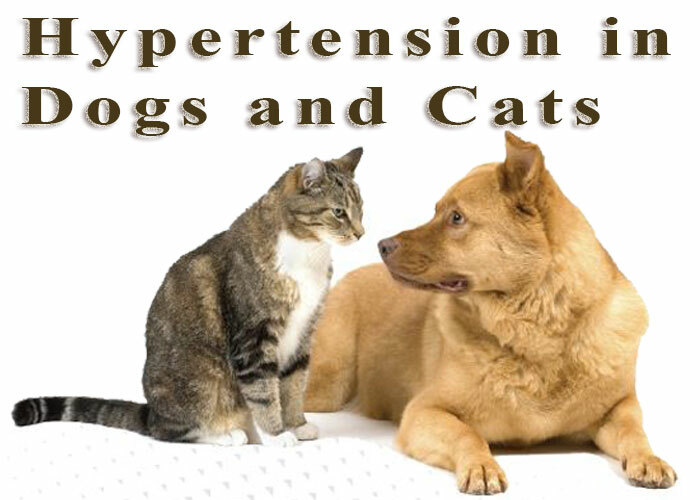 Dogs and cats both suffer from systematic hypertension. Most pet parents like you are quite confused in finding that whether a pet is really suffering from this disease or not. At any point if you find any unusual behavior or your pet depicts most of the following signs, then you need to be serious about this. What are the different causes of Hypertension in canines and felines? According to animal health research, the underlying cause of high blood pressure in dogs and cats is not known yet. However, it has been found that breeding dogs with hypertension has given birth to puppies carrying the same disease. So, it is obvious that genetic component plays role in causing this health condition. The next question comes that how prevalent is this disease in dogs? The results of different studies vary but the most common output shows that between 0.5 to 10 per cent of dogs have hypertension. This illness is most common in 2 to 14 years old dogs. Among all hypertension cases, secondary hypertension accounts for 80 per cent. This is due to numerous factors including renal diseases, hyperthyroidism and hormonal fluctuation. In some cases, diabetes may also be the cause of hypertension, although it is uncommon in dogs. If you suspect that your dog may be suffering from hypertension considering any of the symptoms, then it is better to consult your vet. Diagnosing the condition, your vet can provide proper medication for your lovable companion. Your vet diagnose the blood pressure in your pet same as in humans. Veterinarian places an inflatable cuff on the dog’s paw or tail, and the authentic blood pressure measuring instrument will check the pressure. While measuring the blood pressure reading, it is important that you make your dog still for long enough. To ensure the correct reading, the vet will take five to seven measurements. Usually, the first measurement is discarded considering the dog’s excitement level. If the readings are in dispute, the procedure will be repeated for a few numbers of times. After diagnosing high blood pressure in your furry pal, the first step taken towards treatment is finding the underlying cause of the disease. Vet will first treat this cause so that your dog will probably not be on medications to control blood pressure indefinitely. To ensure control of blood pressure, your vet will give medications such as calcium channel blocker or a beta-blocker. Apart from this, dog’s diet is also considered. Your vet may recommend dog feed lower in sodium. Once your Fido is detected with high blood pressure condition, ensure to regularly check the blood pressure. Your vet may also advice for some lab tests to measure your dog’s reactions to the medications.